Quentin Tarantino came up with a beaut of an idea — a bunch of brainstorms, in fact — for a madcap World War II cartoon. And then never really figured out what to do with them. Inglourious Basterds is a movie about the writer-director’s fevered obsession with movies and, I regret to report, not terribly much more. When you factor out the countless in-jokes and references to other films (most of which will mean zip to 99.9 percent of the audience), what you’re left with is an extraordinarily longwinded, often stunningly dull and frankly insensitive comic fantasy about Jews exacting payback from the Nazis. There are an awful lot of characters and storylines in this movie, but only three of them really matter. The German-born actor Christoph Waltz has resurrected his career in the role of SS officer Col. Hans Landa. He won the Best Actor award at Cannes in May and has received glowing notices for his performance. The thing is, his character, nicknamed “The Jew Hunter,” is something of a one-trick pony, not to mention a cliché. The history of cinema is jam-packed with Nazi officer characters who are gracious and civil one moment and calmly barbaric the next. Now it must make room for one more. The talented French actress Mélanie Laurent plays Shosanna Dreyfus. As a teenager, she escaped into the woods after witnessing the massacre of her family at the hands of Col. Landa. Years later, we find her living under an assumed name in Paris, operating a small jewel of a movie house and hatching a plan to lure the Third Reich’s high command to the place and burn it to the ground with everyone from Joseph Goebbels (Sylvester Groth) to the Führer himself (Martin Wuttke) locked inside. Even in this picture’s topsy-turvy comic book universe, it’s a tad much to expect us to play along with. We’re talking about some of the most powerful and paranoid people who ever lived. In what world would they neglect to bring a small army’s worth of security? Thank God for Brad Pitt. The film comes to life almost solely when he’s on screen, and, if you’re like me, you’ll wind up wishing Tarantino had resisted the temptation to show off and simply made a movie about Pitt’s character and the men he leads. Tarantino pays homage to the squad in the title of his picture but gives way too little attention to it in the story he tells. Only one of the eight Basterds, Sgt. Donny Donowitz (Eli Roth) is allotted even a single dimension — he beats prisoners to death with a baseball bat. (Yes, Quentin, we enjoyed The Untouchables, too). Several squad members are denied even a single line. The original script included backstories for Raine and a number of his men, but the auteur got so carried away cramming in extraneous characters and subplots that the Basterds end up little more than question marks with machine guns. Even Pitt’s character winds up more or less a celluloid pile on the cutting-room floor. That glaring scar around his neck, for example? A remnant of an attempted lynching never referenced in the final version of the film, never accounted for in the matrix of his savage motivation, but pivotal to his fleshing out in the original screenplay. Can you believe a mere 15 years have passed since Tarantino gave the world the masterpiece that was Pulp Fiction? Here’s the bottom line: The man’s still capable of coming up with snazzy ideas, cool twists and the occasional run of inspired dialogue — just not enough of them to sustain a two-and-a-half-hour-long film. I could barely make it through his half of Grindhouse, though I can watch his early work on a weekly basis and never cease to be astounded. 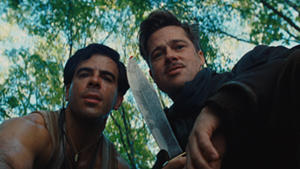 Inglourious Basterds is a fading talent’s attempt to distract from his diminished artistry with what looks like a precocious film student’s riff on Nazis, the Holocaust and a ridiculous, giggling Hitler. Pitt’s performance provides a handful of gut-busting moments, but, those aside, the first casualty of war in this case is fun.